Forests have myriad values, including economic value. But the supply of high-grade timber may be declining. Trees provide clean air and water, wildlife habitat, and beauty. Trees are also vital to local economies. Each state produced more than 700 million board feet of hardwood lumber in 2015. Higher quality hardwood lumber is used to make furniture, cabinets, molding, hardwood floors, and many other products. Lower-quality hardwood lumber is used to make things like railroad ties, crane decks and pallets. For trees in the forest, a complex grading system sums up a stem’s potential, with grade 1 being the best quality. Is the supply of higher graded timber decreasing? A variety of evidence suggests it may be. Forest Inventory and Analysis, or FIA, is a forest inventory program. USDA Forest Service and state agencies cooperate to conduct annual forest inventories in every state of the U.S.
FIA field crews measure plots every 5 to 10 years, depending on the state. The repeated measurements give valuable insight into trends, but also mean that the remeasurement data are correlated – factors that influence the first measurements also affect subsequent measurements. 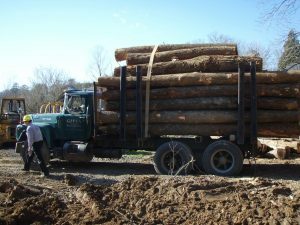 Hardwood logs being transported in Tennessee. Photo by Tom Brandeis, USFS. Brandeis and colleagues used a repeated measures analysis to test for differences in the proportion of each tree grade from 2001 to 2013. The study was published in the journal Forest Ecology and Management. 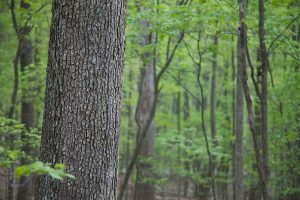 The analysis showed that the percentage of total volume in higher-graded, commercially valuable hardwood timber has declined. In Kentucky, the volume of grade 1 saw-logs fell, and in Tennessee, grade 2 saw-log volumes fell. 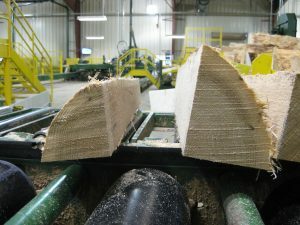 The scientists identified a potential increase in lower quality (tree grade 4) saw-log volume in both states. However, there were sudden increases and decreases in the percentage of saw-log volumes. “This doesn’t make biological sense,” says Brandeis. Unfortunately, the quality assessment and quality control data could not explain the fluctuations. Indeed, a declining supply of high-graded timber would have serious economic effects. In Kentucky and Tennessee, trees are typically cut in partial harvests where about half the stand volume is removed. Partial harvests often mean the best trees are cut and the lower quality trees are left. Brandeis used logistical regression to confirm this trend in a General Technical Report. The GTR shows that grade 1 trees were most likely to be harvested, while lower-graded trees were much more likely to be left. Brandeis’ statistical explorations also show how FIA data can be used, and how the statistical significance of long-term trends can be properly tested. White oak lumber is used for many purposes, including barrel staves. Photo by Tom Brandeis, USFS. For now, overall sawtimber volumes are increasing. However, there are few or no markets for lower quality trees in many areas. For more information, email Tom Brandeis at tjbrandeis@fs.fed.us.